Patrik Lindström EBM Project-X celebrates their 10 years and their sign on to the Swedish giants Memento Materia by releasing an EP containing four remixes. The first thing that stroke me was that all the tracks were taken from the bands latest album 'Modus Operandi' and that the band have released allot more material so they probably would have been able to find some other sweet remixes from. First out is a remix from davaNtage of "Stay Awake" where the band have recreated and given it a more rumbling and dance oriented sound, but still kept the feeling from the original. Second act out is from NamNamBulu that poked a little bit in the song "Regrets" where a new synth loop is the thing you reflect over the most, a little bit of a futurepop feeling. The power noise band Kopfer Kat head right into a remix of "Unreal" where it's extremely hard do find something from the original, if I didn't know it was a remix I would never had sorted it out, but still it's kind of nice listening to it. Finally we are given a vocoder remix by Monstré Mekkunik of the song "No Regrets" where it has been reformatted to some kind of dance remix. I have quite a difficult time trying to see the point with this or to appreciate it. The content of it all is that there is some sweet stuff on this little EP (which is released in the 3" format), but still I think they should have found some material from the earlier days of their carrier to get remixes from. 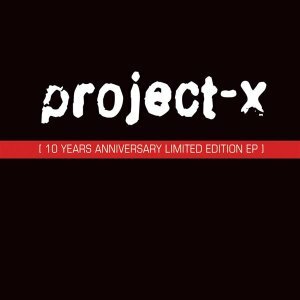 Project-X celebrates their 10 years and their sign on to the Swedish giants Memento Materia by releasing an EP containing four remixes. The first thing that stroke me was that all the tracks were taken from the bands latest album 'Modus Operandi' and that the band have released allot more material so they probably would have been able to find some other sweet remixes from.